Kids Eat For A Squid! Love sushi? Kids love sushi? Then you’ll love our friends at Yo! Sushi’s fab offer running throughout the day from 16th until 23rd October. 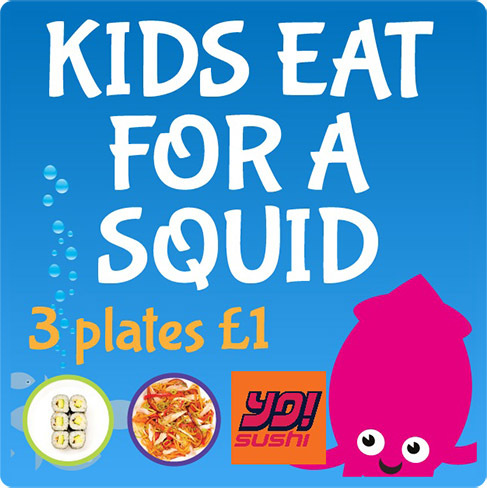 Let the kids enjoy 3 plates for £1 (blue, green & purple) when 1 adult spends a minimum of £10. At the moment, this offer is only valid at the following participating Yo! Sushi’s including Aberdeen Bon Accord & Union Square, Glasgow Braehead, House of Fraser & Silverburn, Edinburgh Harvey Nichols & Princes St, Leeds Harvey Nichols & Trinity, Leicester Highcross, Newcastle MetroCentre, Norwich & York. Yo! Sushi have told us they’re hoping to bring this fab offer down South next week so watch this space. Proof of age may be required, please don’t be offended if asked. This offer is not valid for takeaway. More than one child? If 1 adult eats with 2 kids then the adult must spend £20 for both kids to eat for £1 each and multiples thereof. Offer can’t be combined with other offers, e.g. Blue Mondays.